In conducting research with human subjects, one technique that is used to prevent any preconceptions from influencing the results is called blinding. 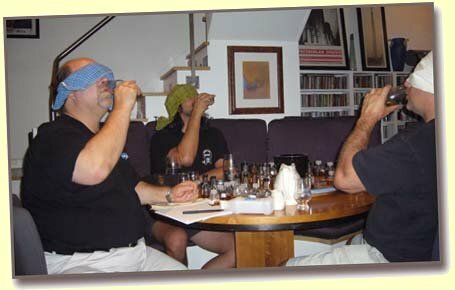 An example of a single blind is one in which the participants don’t know what they are tasting, as in the Malt Maniacs Awards. Quite often there is a control group and an experimental (test) group. A double blind means that the neither the subjects nor the researcher know which is the control or test group. A triple blind goes one step further and not even the data analyst knows which group is which. For my purposes, I took a double blind test without a control or experimental group and added a further blind of my own choice, as you can see in the photo. The samples were selected by my lovely fiancé, Jessica and only had numbers on the bottles. No one during the tasting knew what they were sampling. Randomization was introduced by the use of a lazy susan spinning wheel for sample selection.